With thanks to Jordan for the copy of this novel! As always, my reviews are non-bias and fair. Mary is stuck in Section One, living with three hundred women in a crumbling hospital. She wonders what life was like two centuries ago, before the Cleansing wiped out all the men. But the rules—the Matriarch's senseless rules—prevent her from exploring the vacant city to find out. Taylor's got a dangerous secret: he's a boy. His compound's been destroyed, and he's been relocated to Section One. Living under the Matriarch means giving up possessions, eating canned food and avoiding all physical contact. Baggy clothes hide his flat chest and skinny legs, but if anyone discovers what lies beneath, he'll be exiled. Maybe even executed. Mary's never seen a boy—the Matriarch cut the pictures of men from the textbooks—and she doesn't suspect Taylor's secret. If she knew, she might understand the need to stop the girls from teasing him. If she knew, she might realize why she breaks the rules, just to be near him. Then again, she might be frightened to death of him. Taylor should go. The Matriarch is watching his every move. But running means leaving Mary—and braving the land beyond the compound's boundaries. I'm actually so happy that Jordan contacted me about The Only Boy, because it is exactly what I was needing. I hadn't heard of The Only Boy before I read it, but there were a few reviews (highly praising) so I went in with a good image of what I thought it would be like. And I love the cover. It looks very fitting to the dystopian image. The premise of The Only Boy was pretty explanatory. We did delve into the storyline right away, but by the middle I was absorbed until the end in just one weekend of reading. I felt that I could understand how it would feel that Mary and Taylor were watched by the Matriarch all the time with every move they made. It was definitely spot-on for a dystopian world and the society was a very original idea that I loved. Immediately, we are thrown into the mix of the story in the alternate POV's of Mary and Taylor. Personally, I felt more compatible reading Mary's point of view, maybe because her voice just sounded better in my head than Taylor's, or maybe because I resonated with her as a girl. But nevertheless, with the alternative POV's weaving quick from one to the other, sometimes I felt a little lost because of that quick-moving point of view, but because it was passed faster than usual, I did like that I didn't miss out on any of the action. Mary, our lead female role, is stuck in Section One, surrounded by hundreds of women in a hospital, but being cooped up didn't stop her mind from drifting. I would describe her state of mind as very "wanderer" as in she was very interested in the times that had passed and liked to think of a time when things weren't so strict and controlled by the Matriarch. Whereas Taylor holds a very harmful secret that could get him exiled, even killed, that he was a boy in a compound where they aren't permitted. And after having a connection with Mary, risking breaking the rules would mean being away from her. So does his other choice; running. So there are a lot of reasons why nothing goes smooth sailing for them. Together, I thought they were pretty much right for each other. By the Epilogue, I was so captivated by their amazing journey and story. I was happy and sad; happy that things were good for them being with each other, but sad that the story was over. It was a bittersweet feeling. I was pleasantly surprised and caught up in the twists and turns that The Only Boy took me on. It was unique in it's society and rules, engrossing in it's words and throughout; amazing. For fans of Dystopia and Post Apocalyptic books, this would be a perfect fit. 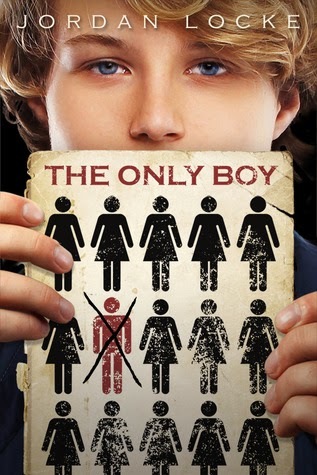 Have you read "The Only Boy"?